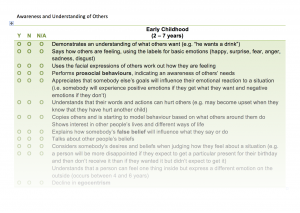 Teaching staff can use each checklist as a quick reference tool to identify whether a child is demonstrating the behaviours associated with a particular age range within an emotional/social domain. The checklists provide a quick method to identify a child’s development in each emotional/social domain. The information from the Developmental Checklists can be collated to create a Developmental Profile for the child, approximating their development across each emotional and social domain. 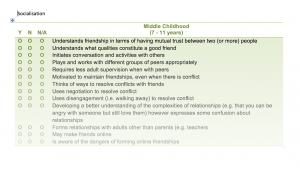 We have put together a series of diagrams which show you that there are different ways of clustering the areas of social and emotional development within Fagus. 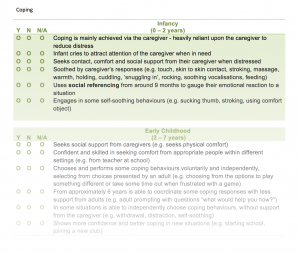 There is no one correct way to group these areas, but it is hoped that these visual diagrams of the clustering of the social and emotional domains will help Fagus users choose which checklists they use for individuals if they feel that it is not necessary to use all the checklists. View the diagrams here. *please note that there is no Developmental Checklist for the attachment. This is because the Attachment domain does not lend itself to goal setting and interventions using the developmental sequence. Language Development is split into 4 checklists – expressive language, non-verbal communication, pragmatics (social use of language) and receptive language.